I'm trying to create a GitHub page with Jekyll on Windows, but to do that I am told I need to install Bash on Ubuntu on Windows. Ok, fine, so I go to Bash's installation guide. My computer is 64 bit, Windows 10, build version 15063.296, which is above 14393, so I should have met the requirements. However, when I follow the instructions, I can't find "Windows Subsystem for Linux (beta)" in Windows Features. What do I do? Edit: Yes, I had Developer Mode enabled, even with it enabled it does not show up. 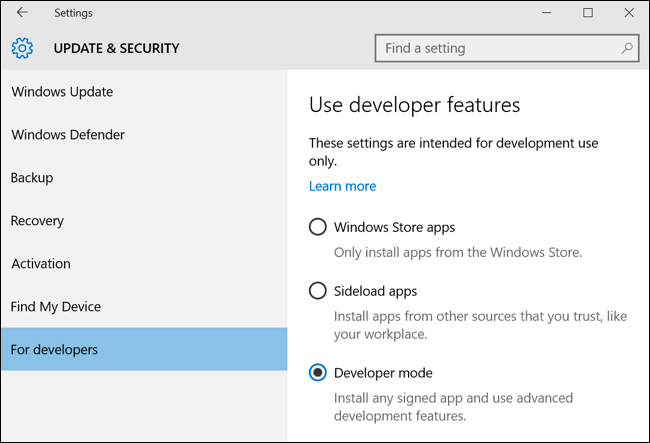 To install Windows Subsystem Linux, you have to enable Developer Mode in Settings App. So open Settings > Update & Security > For Developer > Developer Mode & select it to enable. Then resrtart your system and you are good to go. From Windows 10 build 16215, it is no longer required to enable Developer Mode and beta tag was removed from WSL optional component. See Windows 10 Installation Guide for further details. How do I install the new Ubuntu for Windows on Insider Preview 14295? How to launch Bash on Ubuntu on Windows from third-party application? Can I disable Windows 10 developer mode and still use Bash? Why do I keep getting “Authentication Failed” on Github when running through the Win10 Linux subsystem?